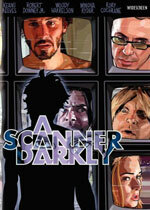 adapted as "A Scanner Darkly"
Synopsis: Bob Arctor is a dealer of the lethally addictive drug Substance D. Fred is the police agent assigned to tail and eventually bust him. To do so, Fred takes on the identity of a drug dealer named Bob Arctor. And since Substance D -- which Arctor takes in massive doses -- gradually splits the user's brain into two distinct, combative entities, Fred doesn't realize he is narcing on himself. 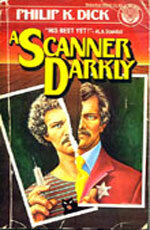 Additional notes: The book cover art is from the 1st paperback edition published by Ballantine.